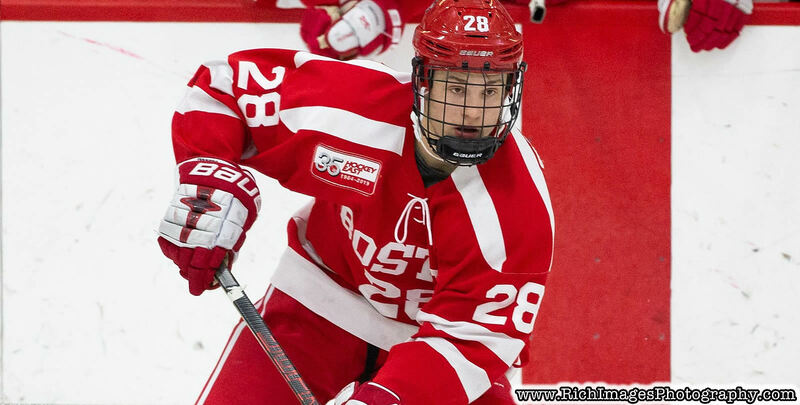 Boston University freshman forward Joel Farabee (Cicero, NY) has been named the recipient of the 2019 Tim Taylor Award, bestowed annually upon the best first-year player in NCAA Division I men's ice hockey, the Hockey Commissioners' Association announced today. He is the fourth BU Terrier to win this award and the third in the last five years. The award is voted on by the nation's assistant coaches and is named for the former Yale University and U.S. Olympic Team head coach. Farabee was 17-19-36 in 37 games for BU, his season ending prematurely after the Hockey East quarterfinals due to injury. Farabee was selected as the Hockey East Rookie of the Week three times this season and his 21 league points were good for eighth in the conference (tied.) He was named to the 2018-19 All Hockey East Rookie Team. Drafted #14 in the first round of the 2018 NHL Entry Draft by Philadelphia, Farabee has already signed with the Flyers and hopes to compete for a position next fall.The runner-up for the 2019 National Rookie of the Year Award was Niagara University forward Ludwig Stenlund (Skelleftea, Sweden). Tim Taylor, for whom the award is named, spent 28 seasons at Yale and became the school's winningest head coach as he collected 337 victories. His tenure spanned from 1976-2006, while taking two years on leave to coach the U.S. Men's Olympic Ice Hockey Team as an assistant coach in 1984 and as the head coach in 1994. Taylor was captain of the Harvard University men's ice hockey team before he graduated in 1963. He began his coaching career at his alma mater, serving as an assistant coach on the Crimson staff under Ralph "Cooney" Weiland and Bill Cleary before beginning his time with the Bulldogs in New Haven, Connecticut. The Hockey Commissioners Association sponsors this award which results from a ballot containing each NCAA Division I ice hockey conference's Rookie of the Year.